Lee-Char swears to Vader that the Mon Calamari will defeat the Empire in Darth Vader #17. Over the past few months, both Darth Vader and the main Star Wars comic series have been telling two sides of the same story—the fall and rise of the Mon Calamari, from subjugation to rebellion. And most interestingly, both series have been telling an intertwined tale depicting two crucial moments in time for the watery world of Mon Cala, a planet whose story first began in the Clone Wars cartoon. The last time we saw Lee-Char during the Clone Wars animated series, the boy prince (turned boy king) of Mon Cala (the home planet of Admiral Ackbar) was being taught by Anakin Skywalker and Ahsoka Tano how to be a leader to his people, and how to resist an invasion by Separatist Forces. Charles Soule, Giuseppe Camuncoli, Daniele Orlandini, David Curiel, and Joe Caramagna’s Darth Vader has given us a twisted version of that story in its past few issues, because Lee-Char has unintentionally found himself going face to face with Anakin once again—this time as Vader leads the vanguard to force the Mon Calamari to submit to Imperial rule. Lee-Char, Padmé, and Anakin in more congenial times during Clone Wars’ fourth season. The Vader comic, which takes place in the years between Revenge of the Sith and A New Hope, has had a different focus than just subjugating Mon Cala—Vader is there on the planet to hunt a Jedi named Ferren Barr, who has been advising Lee-Char (and, weirdly, running a weird sect of disgruntled rebels like they were the next generation of Jedi, despite not being Force users) and stoking the flames of defiance within the young king. But given Anakin’s history with Lee-Char specifically, bringing the two characters together again—and seeing Lee-Char employ the lessons he learned from Anakin, only to fail at the same man’s hands—adds a personal layer of tragedy to Mon Cala’s subjugation, even if Lee-Char never realizes it. It’s not just Lee-Char who suffers in the Empire’s invasion. The sheer scale of the Empire’s escalation of response to his resistance—going initially from peaceful yet forceful talks to bring the watery world closer into the Empire’s fold, to ground invasions, to eventually full-on planetary bombardment by the end of the story arc—is brutal enough to inspire at least some Mon Calamari survivors to rebuild and resist, even as their world is broken. For example, we get to see Rogue One character Admiral Raddus’s defection; he’s so horrified by the scale of Tarkin’s bombardments (continuing even after Lee-Char surrenders to Vader) that he flees his home with the ships he can to join the nascent rebellion. Ferren Barr reveals he’s playing a long game in this week’s Darth Vader #17, much to Lee-Char’s shock. In this week’s Darth Vader #17 , this second chapter in the Mon Cala saga ends when Vader finally reaches Lee-Char but is confronted by Barr, who reveals that the rebellion he’s stoked in the young king was driven by a vision of the future he had—one where he not only saw Mon Cala’s current fall (to the shock of Lee-Char), but a future where the planet would play in a vital role in the real rebellion that would rise up and defeat the Empire. Barr’s own death at Vader’s hands, the imprisonment of the king, the death of countless Mon Calamari citizens in the immediate present, Barr thought, would be worth it, if it meant helping liberate the galaxy at large. Vader #17 sets the stage for the recently-concluded third chapter in the Mon Cala ersatz trilogy in Kieron Gillen, Salvador Larroca, Guru-eFX, and Clayton Cowles’ primary Star Wars series. Set in the months after the events of A New Hope, roughly 20 years after the events seen in the Vader series—Star Wars showed a future where Barr’s vision had yet to come to pass. Desperate for a fleet to bolster the Alliance’s fledgling fighter reserves, Leia, Han, and Luke venture to Mon Cala in the hopes of finding allies that could lend the aid of the world’s fabled fleet, only to find little in the way of the resistance Lee-Char had attempted to instill in his people two decades prior. 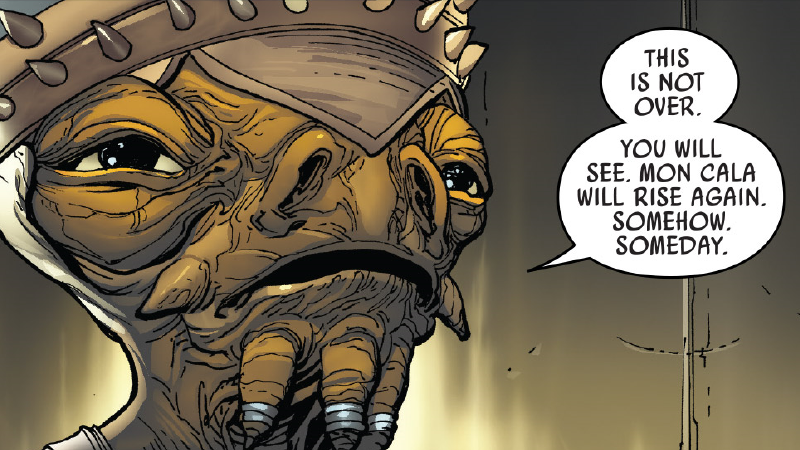 Regent Urtya declines to help Ackbar and the Alliance in Star Wars #44. That is in part due to the ferocity of the Empire’s actions all those years ago, but above all, it’s down to the absence of Lee-Char himself, unseen by the Mon Calamari since Vader captured him. With leaders like Ackbar and Raddus (the latter of whom had at this point already perished after the events of Rogue One) already in the Alliance, and Lee-Char himself hidden away in Imperial custody, the Mon Calamari Leia meets during her mission are nothing like the defiant people she knew. All that’s left is hopelessness that the long arm of the Empire can never be stopped. This ultimately leads to a rather elaborate rescue mission. Hoping to liberate Lee-Char from captivity so that he can re-inspire his people into lending the Alliance its ships, the team finds that there’s more tragedy to the imprisoned king’s story than simply crossing paths with a former ally-turned-foe. The frail, dying Lee-Char revealed at the climax of Star Wars #47. In the years since the events of Darth Vader, Lee-Char has become frail and weak, only kept alive by Imperial medical tech—making it impossible to move him, let alone liberate him and restore him as a figurehead of Mon Calamari resistance. Lee-Char never gets to lead the rebellion Master Barr foresaw, as he’s cut down by Stormtroopers stopping the Rebels’ attempted rescue operation—but he still helps Mon Cala’s rebellion begin. Before being killed, Lee-Char records a dying holomessage for Leia to deliver to his people, urging them take up arms against the Empire, as they once did against the Separatists. Lee-Char’s message inspires a very violent mutiny in Star Wars #48. Although at first Leia doubts the remaining Mon Calamari leadership will release the message, Star Wars fans already know that it’s destined to happen—after all, we’ve seen the Mon Calamari fleet in the movies, helping to win the battle against the Death Star II in Return of the Jedi. So when they do release it in Star Wars #48, it incites Mon Calamari stationed on ships all over the planet to turn on their Imperial commanders, and the rebellion Barr saw all those years ago finally begins. The Rebels get their fleet, Mon Cala starts fighting back, and one day those events will lead to the galaxy being rid of the Empire once and for all. At the very end of Vader #17 this week, the Dark Lord of the Sith tells the chained Lee-Char that Mon Cala is gone, with only the Empire remaining in its stead. It may have taken 20 years—and will take a few more at least until the Empire is truly defeated beyond these intertwined story arcs—but Lee-Char’s defiance ultimately proved him wrong. After all, he did learn how to lead from some of the best.